This morning, I sat down with my Bible open at Isaiah 6-8. I must admit that I sat down this morning more out of conviction that spending time in my Bible was good and essential for my soul, rather than a clear expectation to be deeply encouraged and strengthened. Today, I give thanks to God that my convictions overruled my pathetic apathy. It turns out that Isaiah 6-8 has a lot to say to me about how great and glorious my Heavenly Father is and how sure and certain my hope in Jesus is. My usual weekly routine begins with my biggest meeting of the week: 2 hours blocked out on Monday morning for me to spend in my Bible. Sundays is my most draining day of the week by far with preaching/teaching in the morning service, time spent in our Community Group straight after the morning service, and then preaching and teaching our 11-16s youth group in the evenings. And so, taking my lead from Jesus, I make sure that Monday mornings is blocked out with a decent chunk of time set aside to spend with my Heavenly Father listening to him in his Word, the Bible, and talking back to him in prayer afterwards. For me, this weekly time alone with my Bible is the number one highlight of my week (the other two being Friday evenings when we have our family one-to-one Bible times, and Sunday evenings opening up the Bible with the young people and teenagers). Yet, it surprising how often I have to force myself to stick to it and not find something else to be busying myself with instead. It is like every week I need to be reminded of Jesus’ words to Martha in Luke 10:38-42 and say them to myself: few things are needed – or indeed only one. Choose what is better, and it will not be taken away from you (v42). It is more often my conviction for the need to stop and listen to the Word of God rather than a sense of desire or impulse that drives me to spend time at the start of the week with an open Bible. And so week by week – driven by this conviction – I order my flat white (I study best when surrounded by the hubbub of other people), sit down, turn off my wifi and simply listen – listen with ears to hear and a heart to accept and receive whatever it is my great God needs to say to me. So far, he has yet to disappoint me with silence. Let me be clear. I have yet to hear an audible voice. I have yet to see visions or be carried away in the Spirit. One day God may choose to speak to me in this way and I am open to it happening, but it is not my experience or my expectation. My expectation is very simple indeed. It is this: that as I work my way through books and passages of the Bible, God is speaking to me; speaking words that are relevant to me now or will be relevant to me in days/weeks/years to come. Time in your Bible and in prayer is not just a nice thing to do – it is essential Click & Tweet! In the Bible I encounter words that were given to many different people, in many different places, in many different situations. So I must not assume that what is said is directly applicable to me – I need to get to work thinking about them and understanding them rightly (what is being said, what did it mean for the original hearers, what does it mean for me now, etc). This takes time and effort – hence the big block of time I set aside! But the hard work is always worth it. At the very least, I come away with simply a clearer understanding or a greater appreciation of God than I had before. More often than not, though, I come away with my faith strengthened and my resolve to live for Jesus built up. And occasionally – such as this morning – I find myself astounded at what I am reading and hearing; astounded that this great and holy God is speaking to me, revealing my lowliness in light of his greatness and showing me his grace in Jesus; grace that he should give himself up for me, overcome my sin and death and present me to his Heavenly Father as my Heavenly Father. Obviously, as a vocational minister I am able to block out more time than most to spend in my Bible. Yet even when I was not a minister, I would strive to spend time each day in my Bible. Quantity of time does not necessarily equal quality of time. The amount of time you spend in Word and prayer is not as important as the importance you place on that time. 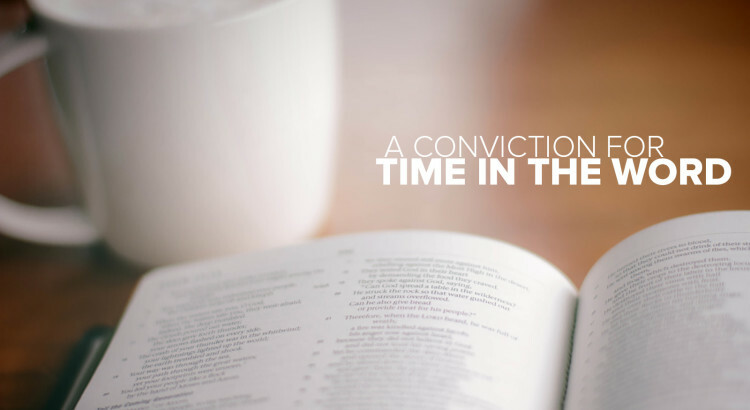 So shore up your convictions: time in your Bible and in prayer is not just a nice thing to do – it is essential for your life and vitality as a child of God. What time (whether 5-10 minutes or an hour) do you need to block out in your daily/weekly routine to spend listening to your Heavenly Father in his Word?